This is the official announcement confirming All Systems Go! For years we’ve been toying with the idea of setting up several small televisions (which we need to find more of), and setting up all of our old video game systems with whatever games we could scrounge up. The overwhelming demand for live music saw those plans get pushed to the back burner. But with a renewed interest in hosting this night by Frank, we have several systems waiting to go including an Intellivision, Sega Genesis, NES, Nintendo Game Cube, and some promises of Atari and other systems to be shared on our monthly nights. Our hope is that avid gamers will bring in their games associated with these systems, and even bring in systems we don’t have yet (TurboGrafix16, Super Nintendo, etc.). Each month, we will have a feature game that will be played on the large projection screen, which will be a multi-player game aimed at encouraging many people to play it all at once. 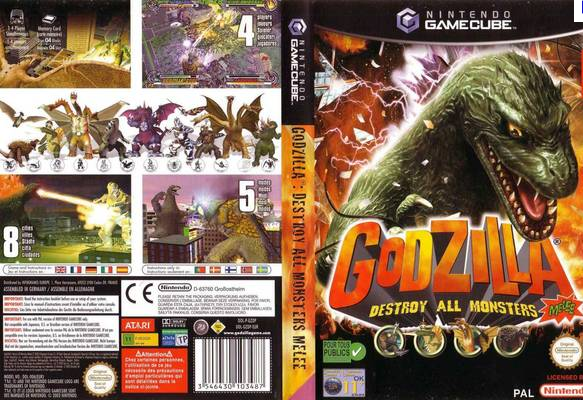 This first feature game on Phog’s Monthly Retro Video Game Night, Wednesday, August 24th is GODZILLA: DESTROY ALL MONSTERS on Nintendo Game Cube. We’d like to thank Marc Houle and The Avalon Front for inspiring us years ago to attempt this on our own. When Marc Houle used to bring all of his Atari systems to The Avalon once a month, it was a hit, and we think this multi-system set-up is going to draw out those of you with all the awesome games you’ve wanted to play with your friends in your favourite downtown living room. This entry was posted in show promo and tagged All Systems Go, Avalon Front, Godzilla, Marc Houle, video games. Bookmark the permalink.